Surveillance studies of influenza A virus of swine (IAV-S) have accumulated information regarding IAVs-S circulating in Thailand, but how IAVs-S evolve within a farm remains unclear. In the present study, we isolated 82 A(H1N1)pdm09 and 87 H3N2 viruses from four farms from 2011 through 2017. We then phylogenetically and antigenically analyzed the isolates to elucidate their evolution within each farm. Phylogenetic analysis demonstrated multiple introductions of A(H1N1)pdm09 viruses that resembled epidemic A(H1N1)pdm09 strains in humans in Thailand, and they reassorted with H3N2 viruses as well as other A(H1N1)pdm09 viruses. 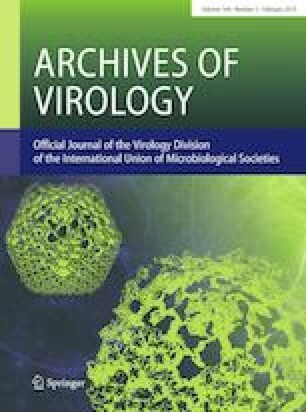 Antigenic analysis revealed that the viruses had acquired antigenic diversity either by accumulating substitutions in the hemagglutinin protein or through the introduction of IAV-S strains with different antigenicity. Our results, obtained through continuous longitudinal surveillance, revealed that IAV-S can be maintained on a pig farm over several years through the generation of antigenic diversity due to the accumulation of mutations, introduction of new strains, and reassortment events. Handling Editor: Hans Dieter Klenk. The online version of this article ( https://doi.org/10.1007/s00705-018-4091-4) contains supplementary material, which is available to authorized users. All antisera raised against human H3N2 viruses, the homologous inactivated antigens, and A/Narita/1/2009 were kindly provided by the National Institute of Infectious Diseases, Japan; A/California/04/2009 was kindly provided by the Centers for Disease Control and Prevention, USA. We thank the staff of the National Institute of Animal Health, Thailand, for arranging and supporting our collection of pig swab samples in Thailand. All of the analyses involving the BEAST software package were conducted by using the supercomputer of AFFRIT, MAFF, Japan. The current research was supported by the Japan Initiative for Global Research Network on Infectious Diseases (J-GRID) from the Ministry of Education, Culture, Sports, Science, and Technology in Japan and by the Japan Agency for Medical Research and Development (AMED) under grant number JP18fm0108008. This article does not contain any studies involving human participants or live animals that were performed by any of the authors.